Going back 24 hours...being introduced as Team Australia; Andrew Heyden and team manager Robert Boyce, standing with the Australian Flag in the Seregno Plaza during the Opening Ceremony was a real buzz. Baton twirlers led a 20 piece marching band through the city centre, belting out energising hits like ‘Eye of the Tiger’ and the less energising, but equally impressive ‘Smoke on the Water’. All the athletes marched behind the band and were graciously welcomed by the local residents, shoppers and store owners who looked all a little bemused by what was happening in their cities streets! We proudly marched behind Andorra, a one-man team, and in front of the larger Austrian team-the vicinity of this Northern Italian town to Austria worked favourably and they were keen to grab a team medal. The biggest cheer was of course left for the even bigger Italian led team, led by the irreplaceable and current 100K World Champion and IAU ultra runner of the year Giorgio Calcaterra. This was a guy who once ran 20 sub 2:20 marathons in a year. All the big ultra running nations had large teams; the USA, Spain, Russia, Japan and Sweden. Go forward to the next morning at the start line and I was gripped by feelings of great anticipation and pride, running for Australia with the elite of road ultra running. Leading into the event, I felt as best prepared as I could be. I had done everything right, giving this race the due respect it deserved. 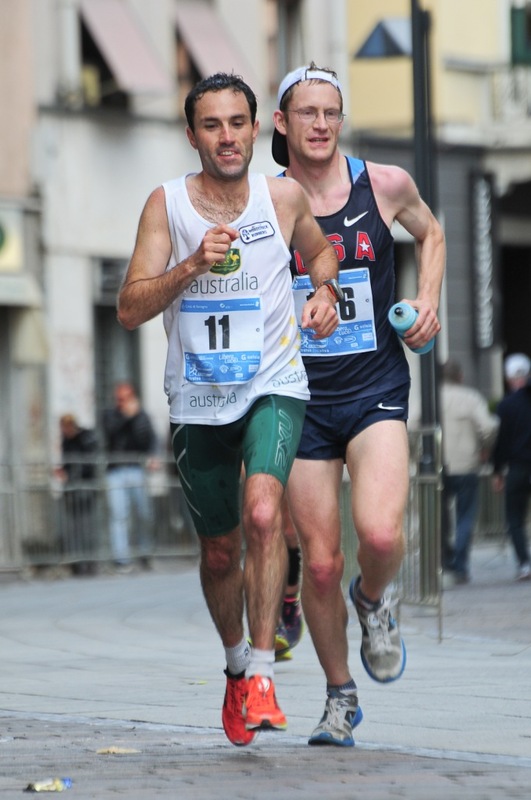 I had done the long runs, 40, 50, 60+km weekly progressions with good mate and Aussie 24h representative Ewan Horsburgh. I had done the back to back long weekend runs and the long taper into the event, walking my way around foreign lands and denying myself the feast of Turkish cuisine day after day. I was fresh and ready to rip in. I had my race plan and I was looking forward to seeing what I could deliver. My previous best at this distance had been 7:31 at the inaugural Commonwealth Ultra Distance Championships in 2009. After this, I had failed twice at the road 100K format, both times pulling the pin at 50K after setting over ambitious targets. I had learnt my lesson, I wasn’t going to jeopardise the outcome I deserved by getting caught up in the moment or by not running my own race. I had crossed off all the little one percenters, and now it was time to execute. My plan was to follow the great Don Wallace’s advice and leave the running until the very end of the race; the build up would be slow but purposeful; measured and precise. It’s the only way to run these events where pacing is crucial and knowing your targets are key. The layout of the course was to my liking, five 20km laps through the streets of Seregno; with only one u-turn it was a quick, flat course. The five lap format was ideal; it was easy to break my race strategy into five parts. The first 20k was the warm up, second lap was to be the building stage, third the consolidation, fourth was the 'let the games begin' and the fifth was always going to be the mystery lap (in other words, let’s see how I feel)! With Robert Boyce positioned at the 10km aid station and my ever supportive wife Nadine at the start/finish, my nutrition and hydration aid plan was in capable hands. This is how the race unfolded. Lap 1, 0-20k: The brisk morning air made for ideal conditions. I started conservatively and had to rein in my stride length and cadence; jogging and barely raising a sweat warming up and introducing myself to some others to run with. I was trying to be as economical as possible with my leg lift and power output. I was keeping fluids and calories up while letting the bunnies go off in the distance. My average km splits were 4:08 and this was, if anything, a couple of seconds faster than I had planned but mentally I was right on top of this race. Lap 2, 21-40k: Was very similar to the first 20km, but I began to ramp up the cadence slightly, while still feeling like a fast jog. I found some packs to run with and protected myself from the little breeze that was blowing. I was running well within myself, but this is not easy! One of the hardest things in ultras is keeping the speedometer under control. I knew during this lap that I was going to have a good day. I kept my fluids and calories up, sticking to the plan of a gel and sports drink or water every 10kms. I learnt the hard way that Italian aid stations are quite different from those in Australia, twice picking up cups I thought were water only to gulp down firstly warm tea and then mineral water! I didn't gain many places but this was not expected at this early stage. My average km splits were 4:01. I was getting a buzz out of the crowd lining the streets and loving it! Lap 3, 41-60k: I started to pull in a few of the packs. I was running with French and American runners, and we gradually reined in some packs that were starting to pay for their quick start. I was in a really good rhythm and felt great. My feet were comfortable, my arms and shoulders relaxed and my cadence was ticking over like clockwork. Thankfully there were no signs of muscular fatigue. In the much more taxing trail ultra races my quads and calves would be beginning to complain by now. I was running as lightly as possible, just trying to kiss the ground before toe off, high on my midfoot. Each kilometre I would focus on something new; rotating between an aspect of my feet, arms, breathing, head and torso. I was listening attentively for the slapping sound of a tired footstrike. I heard them, but only from those that I was passing! Average km splits for this lap were 3:58. Things were on track! Lap 4, 61-80k: This was easily my quickest lap. I was lulled into a false sense of security by my race execution thus far and, depending which way you look at it, I either courageously or foolhardily decided that this was the day to have a crack and go for something special. I began to stretch out, up the cadence and the effort scale. I pulled in so many of the early pacesetting bunnies; they offered no challenge at all when passed, so many of them were fading badly while I was powering on. I probably passed 10-15 guys while also seeing a lot of others pull the pin and succumb to the mental barrier that is another 30 odd kilometres with a broken down engine. At the 70km aid station Rob handed me a cup, with what at that point had been routinely water. With the day heating up, and the opportunity to grab some random liquid to drink only a hundred metres further up at the lucky dip communal aid table, I thought I’d throw this one over the head. Great idea, only that is was Coke in the cup! I could hear chortles of laughter as I ran off. Regardless, it must have still given me the affect I wanted and you know it is a good day when you start passing powerhouse nations like Japan, Spain and the USA. I suspected I must be up in the top 20 but surprised myself and caught Nadine off guard at the 80K mark by coming in seventh and finding her casually chatting to the Irish crew! I was on track for a massive run. Average km splits were 3:52 and by the end of the lap my average splits of the entire race were right on 4 minutes. Lap 5 81-100k: BAM!! From going feeling great to someone dropping the piano on my shoulders! I could not believe how quickly I was breaking down. Without much warning, from the 82km mark, my laps started to blow out worryingly. I walked a couple of the aid and sponge stations and was beginning to be passed by runners that I had passed a little earlier on the previous lap and I knew it was now a real possibility of losing the sub 7 goal and blowing my time right out. They do say these races are run in the last 10 kilometres, had I made my charge a little too early? At the 90k aid station, Rob Boyce this time handed me, in his wisdom, a bottle of coke and it made an immediate difference and I began running myself out of the bad patch! Back to running instead of shuffling, hitting 4:10-4:20kms again and even passing one French guy that had only a couple of kilometres earlier passed me. I was battling it out with a US runner with whom I had run a large section of the race with, I had no idea of my position but it didn't matter, the sub 7 was the only goal. In the last 2-3kms, I battled, but he put on a great surge with a km to go and I couldn't go with him. My average km splits were 4:34. I’d thrown the dice and come out slightly behind, but nothing ventured nothing gained! Reflecting back on this race, I know the overwhelming sense is that it was a successful race. But I can’t help but think that at the 80k mark I was on track for a massive negative split and the perfect of perfect races with an approx 6:45 finish time and very high finishing position. However, it was not too be, the bad patch from 82-91km probably told me either that I made my charge a little too early or put just a bit too much into the previous lap. I tend to think it was a bit of both, especially towards the end of the 60-80km lap where I was putting efforts in to chase down guys that were no longer struggling, but actually running quite within themselves. I think I may have gotten a bit greedy with the passes. Resigning myself to just ease back behind these guys that were running well and settle down the pace would probably have been the wisest choice. But in the heat of the battle, these decisions are difficult to make! On the positive, I reached my 'A' goal of sub 7 hours and the bonus was finishing in 11th place, which seemed was destiny given this was also my bib number! Pacing wise, I was disciplined early on, something I have struggled with in the past but this race proves that in ultras, the idea is to ease into the race and aim for a negative split. Fellow Aussie Andrew Heyden went in with a few niggles but toughed it out bravely to finish in a very smart time of just over 8 hours. The winner was home town hero Giorgio, with a sub 6:30 time. It was, as always, a great honour to represent Australia and I really did enjoy training and racing again on the road after concentrating on trail ultras so much in the last year or so. I definitely encourage all ultra runners to have a go at the road or track ultras. Road and trail are different disciplines altogether and road ultras can teach you so much about economy, rhythm and pacing that trail ultras don't really allow you to do. I really hope that we have two full teams at next year's World Champs in Korea. There is so much in our favour. It's only a short trip from Australia and it's roughly in the same time zone. I have a feeling there won't be as many of the European nations represented either, due to travel and expenses. The course is flat and fast and you can be sure of Korean efficiency with the organisation. I really believe we have the quality in our ultra running ranks to challenge for team medals. Unfortunately there are not a great deal of qualifying races and this is so often the hardest part of getting in the team, but with the race in October next year, there is plenty of time to prepare and plan a qualifier. Lastly, I would just like to thank AURA for their support and selection in the team and in particular Rob Boyce for his efficient and smooth managing on the ground in Seregno. Thanks also to team captain Andrew Heyden for his support and of course my wife Nadine for impeccable crewing and putting up with the alarm clock going off so early in the morning for so many early morning training runs!